The Jets used all eight of their picks in the 2017 NHL Entry Draft and the clear focus was stocking the prospects cupboard full of defensemen. The team selected just two forwards at the draft, while obtaining plenty of size to go along with skating ability on the back end. That’s now a total of seven defensemen from the past two drafts that Cheveldayoff has targeted. The theme continued for the Jets as they took another big-bodied, skilled forward from Finland for the second straight year to open their draft. At 6-3 and 209 lbs., Vesalainen has all the intangibles to be a star for the Jets one day, possessing size, speed and skill. The one knock on the young Finnish winger is how raw his game is to this point and how much development he needs before he is ready to face the daily grind of an NHL schedule. 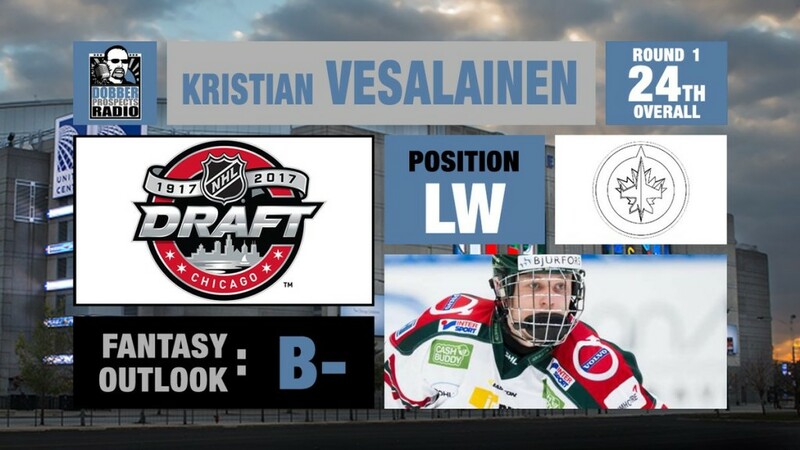 Considered a consensus Top 10 pick at the start of the 2016-17 season, Vesalainen continued to plummet down draft boards as he struggled in both the Swedish and Finnish elite leagues. It wasn’t until his appearance at the Under-18 World Junior Hockey Championship – six goals and 13 points in seven games – that he showed flashes of that high-end skill that scouts loved early on in 2016. Vesalainen has already announced he will return to Europe for the 2017-18 season, where he will continue to develop his raw talent before one day making the trek to North America and becoming seasoned for the NHL game. Samberg is a big, smooth skating defensemen with a solid-two way game. The Minnesota native flew under the radar a bit at the draft, but rest assured the Jets front office are licking their chops with this pick. Samberg possesses a heavy shot from the point and led all defensemen at Hermantown High with 10 goals and 28 points last season. The 6-3, 211-pounder will make his freshman debut with the University of Minnesota-Duluth this fall, where he will likely play out the majority of his scholarship (if not all of it) before he is ready to join the Jets on a full-time basis. The Jets elected for more size on the back end with their 74th overall pick and Kovacevic definitely provides that. At 6-4, 208 lbs., the native of Grimsby, Ontario is a bit of a late bloomer being drafted in his age 20 season. Kovacevic has an untapped offensive upside – three goals and 19 points in 36 games with Merrimack College last season – and is as defensively sound as they come. The 20-year-old projects as a deep stash in fantasy leagues and will likely need a lot of development before he is ready to contribute on an NHL level. Kovacevic joined the Jets for their development camp during the final week of June and will return to Merrimack for his sophomore year this fall. Virtanen managed to play in just five games for his home club in the Finnish under 20 league, thanks to a serious shoulder injury that sidelined him for the majority of the season. The one knock on Virtanen is his skating ability, often showing a lack of a quick first step. However, he can drive to the net well while in the offensive zone and is strong in the face off circle with great defensive skills in his own end. We saw flashes of this during Finland’s silver medal performance at the Under-18 World Junior Hockey Championships, where Virtanen scored two goals and six points in seven games. With a strong two-way game down the middle, he could one day push for a second line center role, but will need plenty of development in Europe before he is ready to make the trip across the pond. It was a strong first season for the German-born defenseman in the QMJHL as he finished with eight goals and 32 points in 54 games for the Cape Breton Screaming Eagles. Gawanke’s 0.59/PPG ranked him second among QMJHL draft-eligible defensemen, trailing only Pierre Olivier-Joseph (1st round pick of the Arizona Coyotes). Gawanke plays more of an up-tempo style as a blueliner, joining the rush whenever he can making a solid first pass out of the defensive zone. He will need to improve in his own end, and a few more years in the QMJHL should help him get accustomed to the North American style. Holm debuted for Karlskrona in the second tier of Swedish leagues this season, appearing in 26 games and posting a 2.91 GAA and .906 SV%. The 18-year-old is expected to make the jump to the SHL this season, where he will continue to hone his skills in the net. Holm has plenty of size at 6-4, 213 and will join the line of Jets goaltending prospects behind Connor Hellebuyck and Eric Comrie. The Jets may have found some late-round gold with their first of two picks in the 7th round. McKenzie is extremely under-sized at just 5-7, 154, but don’t let that fool you as he is as scrappy as they come. What he doesn’t bring in size, McKenzie makes up for in work ethic and he is definitely not one to shy away from the corners or any physical challenge. The 19-year-old enjoyed a breakout season in the WHL playing alongside first-rounder Cody Glass to the tune of 42 goals and 84 points in 72 games. McKenzie has great speed and a great shot, and he won’t be afraid to put the work in to make the step from the AHL to the big time. The Jets rounded out their draft by taking another big-bodied defenseman with a big, heavy shot. Evingson led all NAHL defensemen with 12 goals and 52 points in 59 games last season and will start his freshman season with UMass-Lowell in the NCAA this fall. With his 6-5, 214-lbs frame he likely won’t lose many puck battles, but his skating still needs work as evidenced by 125 PIM last season. Like many teams, the Winnipeg Jets found themselves in a conundrum when it came to their protection list ahead of the 2017 NHL Expansion Draft. Most notably they left defenseman Tobias Enstrom unprotected, however general manager Kevin Cheveldayoff worked out a deal with Vegas Golden Knights general manager George McPhee to keep him from scooping the veteran blue liner. To many raised eyebrows, Cheveldayoff parted with quite the package to sway McPhee in a different direction by sending their 2017 1st-round pick (13th overall) and a 2019 3rd-round pick to the Knights in exchange for selecting veteran UFA Chris Thorburn and the previously acquired Columbus 2017 1st-round pick (24th overall). The Jets moved back 11 spots in the first round, while also giving up an additional future pick, and time will tell how this plays out all to protect a 32-year-old defenseman with one year and $5.75-million remaining on his contract. The Jets front office made two minor splashes in free agency this summer with the additions of goaltender Steve Mason and defenseman Dmitry Kulikov. Mason will fill the void of the veteran presence in the crease that was left by UFA Ondrej Pavelec. The 29-year-old inked a two-year contract with a $4.1-million AAV and will compete with Michael Hutchinson and recently signed Connor Hellebuyck for starts this season. Perhaps the short term deal with Mason suggests that management still has their sights set on Hellebuyck as the goalie of the future. The Jets hosted their development camp from June 26-30 with the a mixed bag of their previous three draft classes. Most notably were defensemen Logan Stanley, Dylan Samberg, Jack Glover and the recently signed Sami Niku. Up front the Jets invited the likes of Kyle Connor, Erik Foley, Jansen Harkins, Brendan Lemieux, Jack Roslovic and Kristian Vesalainen. The Jets inked four of the aforementioned camp invitees to entry level contracts – Stanley, Roslovic, Niku and Harkins – all of which are expected to join the Manitoba Moose in the AHL this season. Connor and Roslovic will definitely get every opportunity to earn a spot with the big club to start the season considering the Jets signed a few veterans in Michael Sgarbossa and Brandon Tanev to a pair of one-year, two-way contracts to fill out their forward corps.